Sunshine on my shoulders, in my face, on top of my head, on my arms, legs … all over me. That’s okay when it is 30 degrees F., but when it is hot and humid it makes it mighty uncomfortable out there riding as well as dangerous and even deadly. Consequently I can’t go along with the song lyrics of it making me happy. So I ask ya … which trail would you prefer to be riding on? There certainly is a world of difference. That shade feels soooooooo good! Actually these pictures are of the same trail (Maumee Pathway near Fort Wayne, Indiana). Fortunately it is mostly shaded. And it is my favorite local trail to ride, especially during the summer months when it is hot. I mostly ride on it just so I can be in the shade and take advantage of the cooler temperatures found there. I would guess that about 6.5 miles of the 8 miles or so I usually ride back and forth on is well shaded and another 1/2 of a mile is somewhat shaded. And depending upon what time of the day one is riding out there some of the remaining trail is shaded for awhile. Now I ask ya, doesn’t that look inviting? Over exposure to the heat is dangerous and deadly. So be careful while out riding when it is quite hot and humid. Be sure to stay well hydrated and avoid being out under direct sunlight anymore than necessary. We need the sun, but be respectful of it as it can do a number on you. Heat can make you feel miserable and even kill you. I am not a medically trained person, but I know that if we start to feel overly hot, flushed and weak we need to stop and find shade to get relief from the heat. We should do something to help cool down our bodies, especially our heads. Pouring water over us or soaking a cloth of some sort to use to wipe ourselves with will help. We should relax and allow ourselves to cool down and recuperate before trying to go on. If we are by ourselves it is most important that we discipline ourselves as we have no one to give us aid should we need it. If we are with others we need to watch out for one another as there may be signs we miss that someone else picks up on. Slowing up and not keeping up the pace may be such a sign as heat can zap our strength. The older we get the more we need to be concerned about all of this. Even so a young person can be overcome by heat exposure. A 12 year old boy died from the high heat while hiking on a trail just recently out near Phoenix, Arizona. Oh, before ending this article I want to mention the use of canopies. They do help in comfort while riding. I certainly have nothing against them and would myself like to have one on my trike. However, I can’t for a couple of different reasons I won’t go into here. What I want to point out is that they only offer immediate shade and usually only partial shade at best as they don’t shade all of the body. And the bigger factor is since it is only local shade and not constant shade over the entire area where we are riding they don’t lower the temperature. It is still hot. I really enjoy riding along a very shaded trail as it feels so much more comfortable than out under the sun. The difference is temperature can be considerable. Many of us know the popular commercial where we hear the words “It’s not nice to fool mother nature!” Well, I am here to tell you that it works both ways. It is not nice for mother nature to fool us. Of course, sometimes it is a case of “mine eyes deceiveth me”. While riding along a trail I frequently see “something” up ahead which from a distance appears to be another person. As I get closer I discover that it was not another person at all, but rather it was a tree, a bush or a sign of some sort … something other than what it first appeared as from a distance. Often times there was sun shining on it … a matter of the sun managing to find its way down thru the tree foliage and illuminating just a small area in the midst of an otherwise dark shaded area. I also see what appears to be litter along the trail which I am prepared to pick up to properly dispose of it. As I get closer I discover it is only a leaf that the sun is shining on which makes it stand out and take on the appearance of man made material … litter … out there on or alongside of the trail. It is not such a big deal except sometimes I have slowed way down to retrieve it only to find out it was for nothing and I have to expend all the effort to get going again and back up to speed. Another thing that happens frequently is seeing a bright green or yellowish color in an otherwise dark shaded area. I am thinking it is another person wearing one of the safety florescent colored shirts or jackets. But no, it turns out to be sunlight striking some green vegetation and once again fooling me. The following is a reposting of an article I wrote quite some time back when I first started this blog and then deleted it … losing all my postings other than a few text files I saved which can be found HERE. 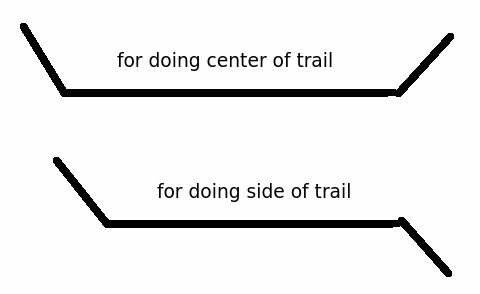 If you are fortunate enough to have bicycle trails near you that you can ride on I hope you appreciate it and realize that it takes a lot of money and effort to build and maintain them. Money is always in the forefront and even moreso in recent years with the bad economy being forced upon us by our national governmental leaders and international bankers. Without money available the building of new trails and upkeep of current existing trails is hurting. Many places a key part of the upkeep is accomplished thru volunteers. Most trail systems have some sort of organized volunteers to serve in various capacities. Here in Fort Wayne, Indiana where I live we have the “Greenway Ranger” program as well as the adopt a section of thr trail program. I am one of about 81 current greenway rangers for our trails. The number has gone down as there was about 10 or so more last year. We have over 90 miles of trails now so that equates to a need of over 180 greenway rangers. We are only about 100 shy. See what I mean about the need being there? Here is my official I.D. card with a little of my photo editing fun (I added the part about badges) and the official city seal removed as I don’t want to get in trouble here. Here is a picture of some of us at a ranger meeting. On our trail system each of us is responsible for a half mile section of the trail. A few have one mile sections. Our job is to help the management of the trails by informing them of anything that needs attention. We pick up litter keeping the trails in good shape. We are expected to clean up litter up to 10 foot off of each side of the trail. Broken glass is one of the biggest problems out there on the trails. We live in a day and age where there are people who seem to get their kicks out of breaking glass on the trails, streets and sidewalks where they know bicyclists ride over it. I clean up most of it myself which I come across, but occasionally I call it in instead. We help other trails users providing them with helpful information about the trails and provide assistance if they are experiencing mechanical problems and need help. 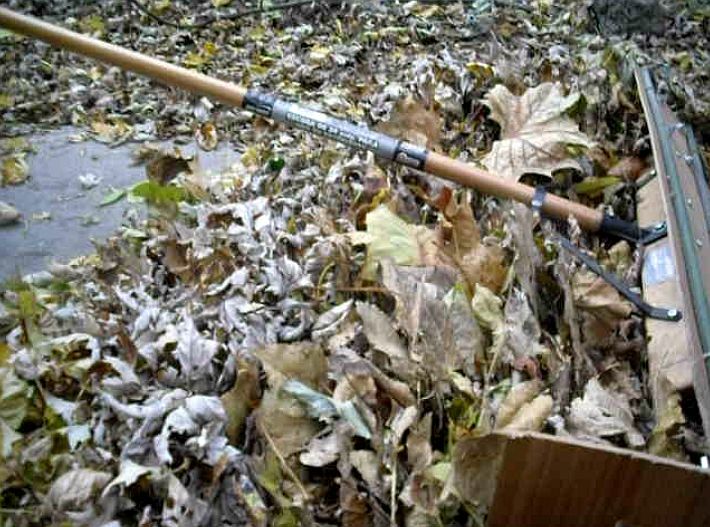 Some of us pick up tree branches off of the trails and even trim various types of vegetation growing along the trails. There are a few of us who ride the entire trail system and cover much of it on a daily basis. We help with the entirety of the trails not just our assigned section which is a very big help to the management folks. I was already doing most of this before I officially joined the volunteer program. 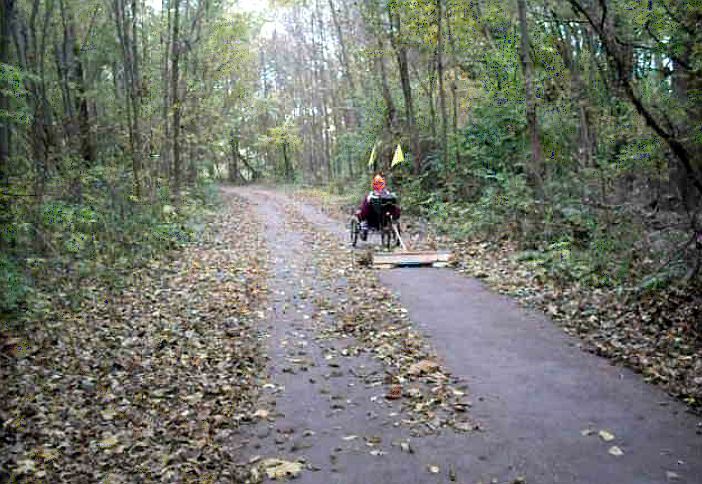 HERE is a webpage concerning volunteer opportunities with out local trail system in Fort Wayne, Indiana. There is a good chance similar volunteer opportunities and needs exist near you if you live near trails. In addition to the Greenway Ranger volunteers our local trail system also have an Adopt a Greenway program where a group of volunteers are assigned a 2 mile section of trail to help care for. They go out a minimum of two times a year to do a more thorough cleanup of their section of trail. By more thorough I mean they go further off of the trail into the nearby areas off to the sides. I am sure most people who use the trails don’t have a clue what all goes on to keep the trails in condition to use. I am telling you this because there is a great need for volunteers and it is something many more need to get involved in. In doing so you help make it possible for everyone to use the trails. You may not get a lot of expression of gratitude from others as like I said, I don’t think most trail users have a clue what all is involved to keep the trails open and in good condition for their use. I got a chuckle out of a bicyclist passing by on the trail earlier today when myself and my two friends I ride with stopped to trim back some bushes which were growing out over the trail. When he saw us there he apparently thought something was wrong and asked this as he rode by. I thought it was pretty obvious what we were doing, but that is exactly what I am talking about … others not having a clue. I was just looking at a website listing trails in Georgia. My wife and I lived down in the Atlanta area for 10 years so I still have an interest in that area and was wondering about trail development down there. My thinking was … “What if we still lived down there. Would we have trails to ride on?” What I discovered seems to be a universal problem most places I know of. I am talking about connectivity. There are various trails, but most of them don’t connect together so they are not very practical to ride on at this point in time … especially the shorter ones. 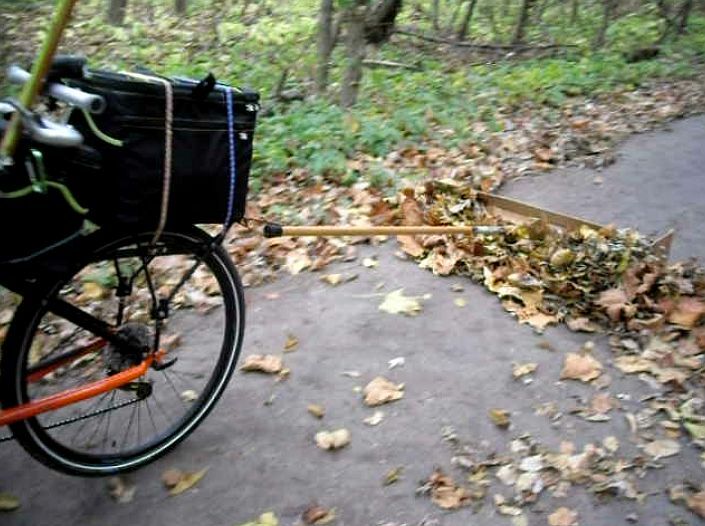 It is not hardly worth it to load up your trike and haul it many miles to get to a trail that is only 2 to 4 miles long. Of course, there are trails around which are much longer … more distance than most people would want to attempt in one day’s ride. Yes, connectivity is a problem. Some of our trails around here where I live don’t connect together at this time so I don’t usually ride on them. I pretty much stick to the trails that do connect together. Right now all of our local trails are linear. We can ride to the end of it and then have to turn around and come back the same way we had just come. Again, someday this is suppose to change. They are planning some more trails which will make a loop we can ride. That would be nice. Lots of future trails are planned. There is just one problem … money. Trails are very expensive to build and maintain. It is my understanding that our trails around here cost about $125 a foot and that is just the part that is asphalt. Boardwalks cost about $500 a foot. With a struggling economy which is getting worse and not likely to turn around (I think it is going to totally collapse as that is the plan of those running things) these future trails will not likely materialize. When it comes to recipes adding water is quite common and works well oftentimes. However adding water in not a good ingredient when it comes to certain other things like electricity, picnics, sun bathing, and cycling to name a few. This year has been a terrible year for rain … too much of it (or not hardly any) … in some parts of the United States. That includes the area where I live. We have had record breaking rains and just recently we finally have got some decent weather and things are starting to dry out. However we still only have very limited trails open and available to use. All the flooding, high winds, etc. have devastated much of our trail system and it will take a long time and a lot of work to get them cleaned up and back open. The rivers have just recently finally dropped down below flood stage so the cleanup effort is just getting started. These 4 pictures below are not of our area, but they are typical of what our trails look like as far as being flooded over. 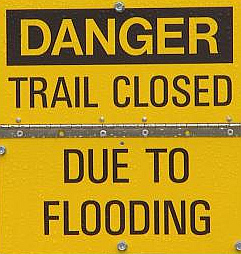 In the video below keep in mind that the trails run right alongside of the rivers so when you see the river which is considerably flooded over in various areas much of the time the trail is underwater. And here is a video shot from a drone helicopter of the flooding in Foster Park … one of the places I had never witnessed flooding occur before. 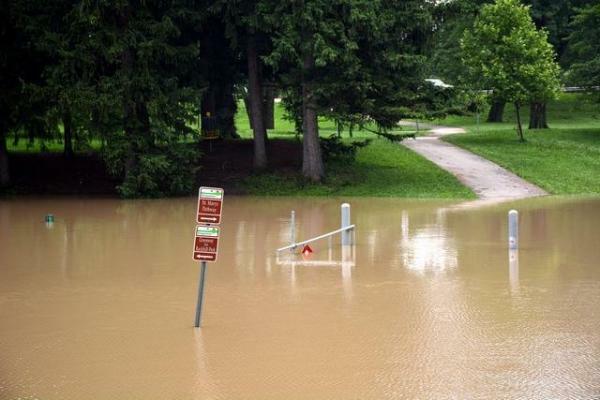 Most of the park and golf course was under water. There is horrific damage to much of the grounds. I was just out there July 22nd and saw some of the result of the flooding. This picture below is in one of our local city parks. This is one of the trails which passes thru it. Even after a few days of nice weather the water is still across the trail although not nearly as much as pictured here. 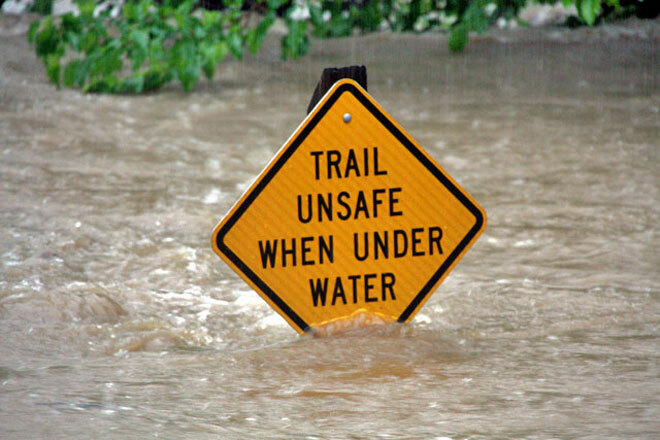 I would guess that the water was about 30 inches deep over the trail when this picture was taken. The city did make an effort to start cleanup work on one of the trails only to get two trucks and a skid loader stuck. First one got stuck and then the second got stuck trying to pull out the first one. The skid loader got stuck trying to pull out the trucks. Upon getting them out of their predicament they gave up until the mud has dried up more. There is not only ‘gobs of goo’ (river silt mud which is some of the worst mud imaginable), but there are large trees down and plenty of smaller ones as well. As an avid trail user it is difficult to deal with. This is the second worse flooding on record for this area. As I previously stated, I have seen areas flooded over that I have never seen flood before. Several city parks and golf course were pretty much destroyed by flooding and will take a lot of work and money to repair/restore them. With this recent dry spell it is hoped that the rain pattern we have been experiencing this year is over with and things will return to normal. 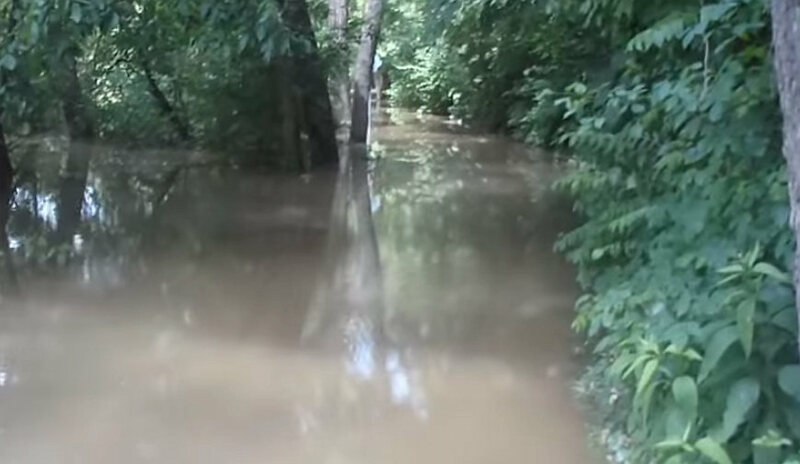 I have posted this picture of a flooded section of trail before but I added another picture alongside of it so you can see what the area looks like when it isn’t flooded. There must be at least 3 or 4 gallons of water there. The area where I have a white X is more than 7 feet of flood water over the trail. The river is off to the left hand side. The farmer’s field on the right becomes a very large lake. Somebody just added water and ruined a good thing. 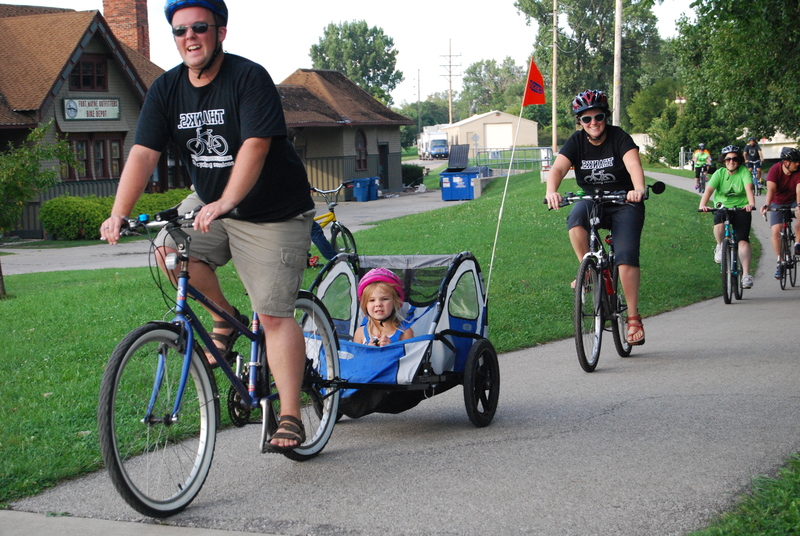 The reason for having a tadpole trike is to ride it, but in some parts of the United States it has been and continues to be a difficult year to get much riding in. That’s because of all the rain … day after day … week after week … month after month it seems. It is a year to remember. When is it going to stop? I mean like … give us a break! 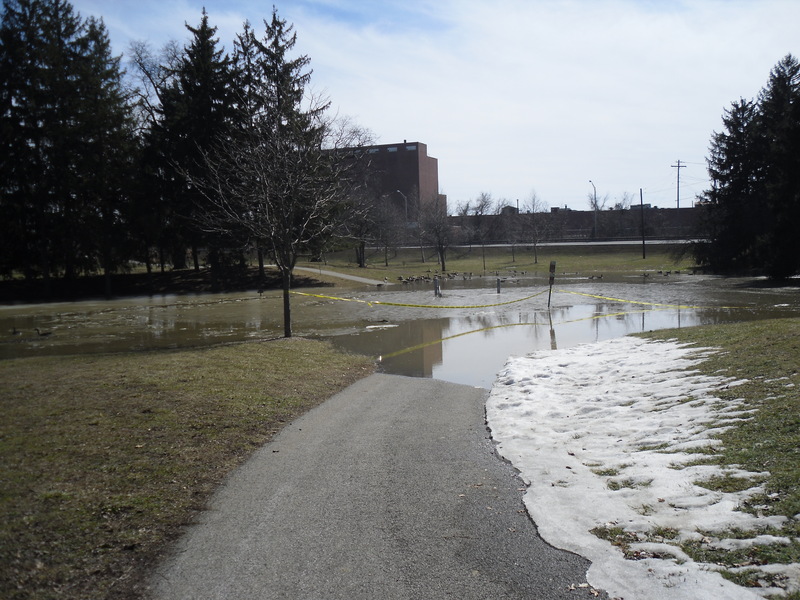 Even what little time has been available to ride there is so much flooding that there are very few places to ride without encountering flood water … closed trails, closed roads and streets, closed city parks. Then to top it all off there have been some strong winds in some of the storms which have brought numerous trees down which are blocking off trails. Some of the trees are huge. With all the rain the ground is so saturated that the entire root system under them just pulled up out of the ground. 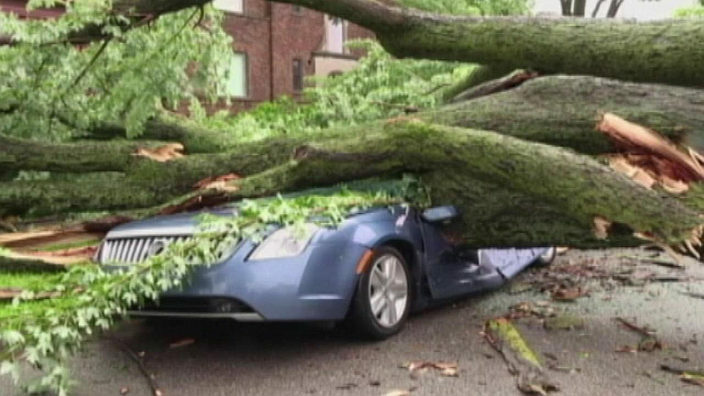 Many others were simply snapped off or large branches were snapped off. Many fell onto houses and cars/trucks. I have ridden around various parts of the city and seen many such scenes. They were also blocking streets and sidewalks, but at least those are usually removed fairly quickly. The bike trails haven’t been touched though and probably won’t be for some time. Some are still flooded. 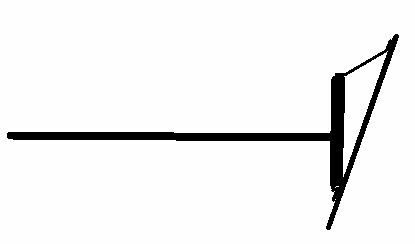 In the image below the red line shows about where the bicycle trail runs. 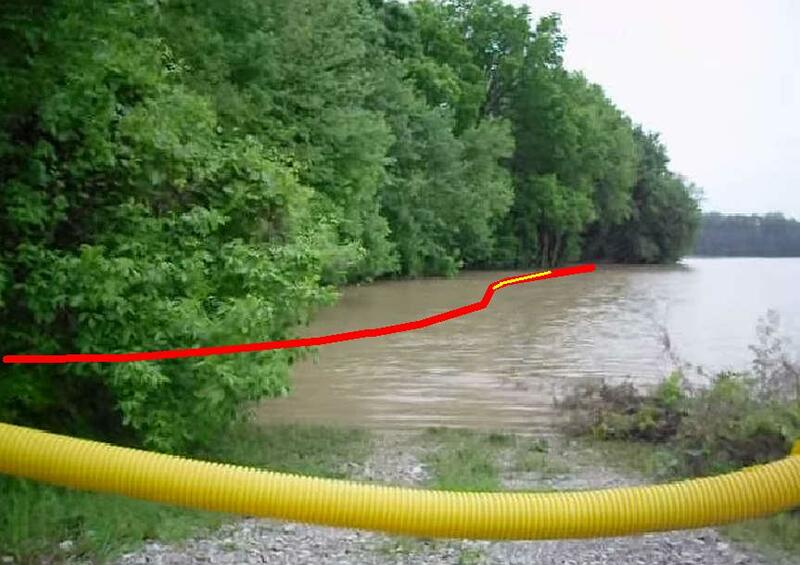 There is more than 7 feet depth of flood water over the trail about where I have drawn the yellow line on the red line. The river is to the left beyond the trees. This image below is of the St. Joe Pathway near Parnell Ave. As you can see it is completely flooded over. The river is to the left. Other trails are a muddy mess and with all the rain aren’t drying up. 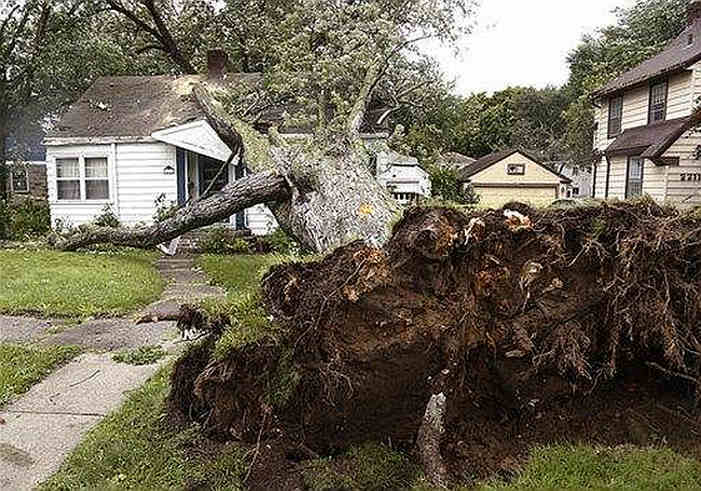 That means that nothing can be done about clearing the trees off of them. Besides the city is too busy dealing with cleaning up other places which take priority over the trails. That is the story here where I live. Then there are parts of the nation experiencing bad drought conditions. They desperately need the rain. I sure wish we could send some of ours their way. Not only are they experiencing drought, but they having scorching heat making it miserable and dangerous to be outside. Fires are a serious threat when these conditions exist. I know that there are those who say “just ride in the rain”. To that I say “no, thanks”. I don’t find that enjoyable at all. 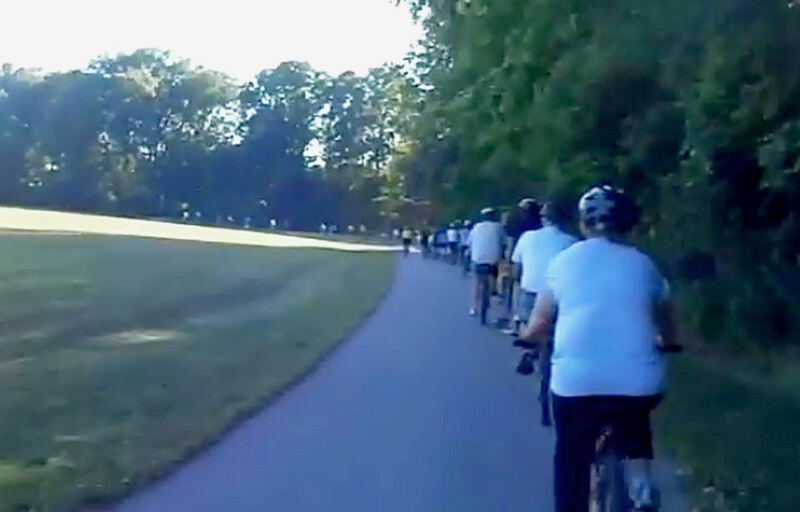 Every Tuesday evening at 6 PM from April thru October here in Fort Wayne, Indiana the local trails authority conducts what they call Trek the Trails. 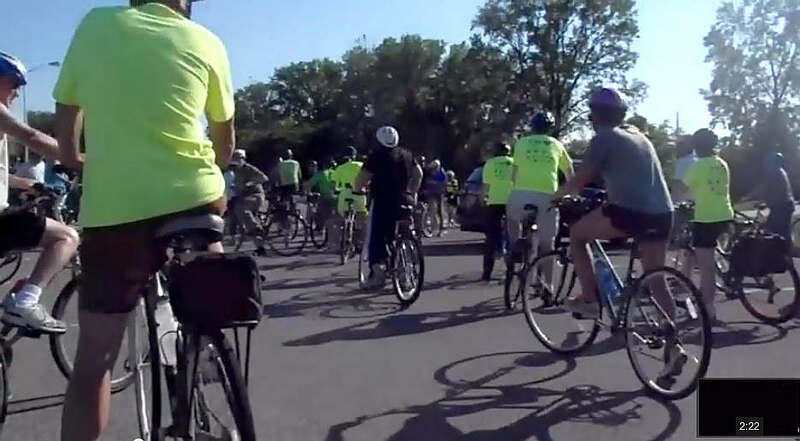 Each week they have an organized ride where bicyclists can show up at a designated starting point to form up and head out riding a different section each week. By the end of the “riding season” they will have covered the whole trail system and probably repeated some of it. The rides are usually about 6 to 9 miles long. They are open to all and families are most welcome. Depending upon the weather the turn out is usually pretty good … 60 to 100 riders. Someone always leads the rides and someone always brings up the rear making sure everybody made it ok. I have only personally ridden on a couple of them as I ride all of the trails frequently and know them all quite well. The main purpose of these rides is to introduce people to the local trails and help them to learn about them. Probably at least 4 times during these rides they offer special events in addition to the ride itself. Sometimes they have a live band, food, dance, bicycle giveaway by drawing, etc. On one such ride they go to a predetermined location out away from the city lights where they have telescopes set up to check out the stars and whatever else they can see in the heavenlies. Here is a video of one of the rides from 2012. It is on the Saint Joseph Pathway to Shoaff Park. It started out at Johnny Appleseed Park. And HERE are other videos of these rides. 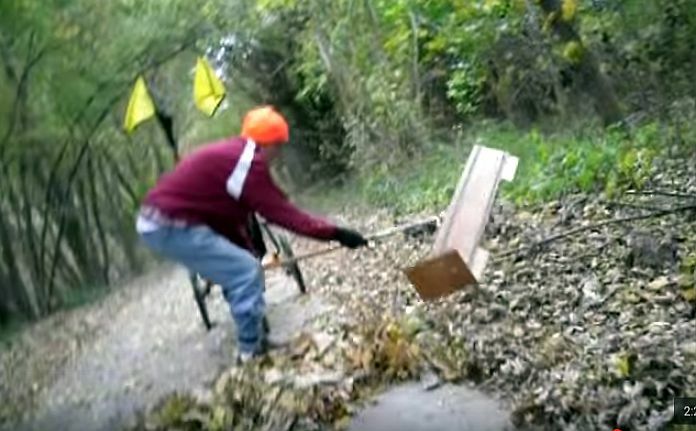 And HERE are other videos of Fort Wayne Trails. In addition to these Tuesday evening rides they also have a Saturday morning ride once a month which is longer and geared a little more for those more serious about riding including a little faster pace and longer distance. But again, it is open to all and someone brings up the rear ensuring everyone makes it regardless of whether they keep up the pace of the leader. These rides always get spread out considerably. Even the Tuesday evening rides do, but probably not as much.